Local Hard rockers Nitidus are combining their forces with 2007 ARIA nominated Airbourne this Saturday December 15 at 21st Century in Frankston for what is guaranteed to be a sweaty, loud and totally unadulterated expression of rock’n’roll. Pick up a copy today from your favourite pub, skate shop, wherever (relax, they’re free) and head down to the gig this Saturday. It’s the last Nitidus rock show for 2007 and we intend to celebrate! Get your tickets at shop.nitidus.com.au before the gig. This is the big one, the greatest rock and roll show of 2007! 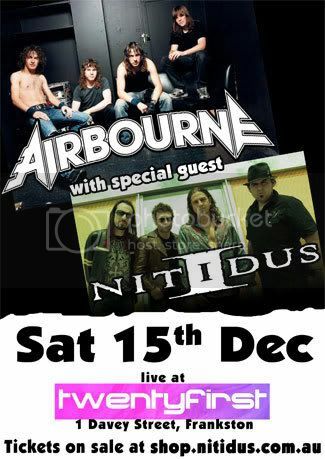 Nitidus will be joining the mighty Airbourne for the last show of their tour! Airbourne were nominated at this year’s ARIA Awards for best rock album and are currently on tour in the U.S.A. with their debut album Runnin’ Wild. The rock extravaganza happens on Saturday 15th December at the 21st Century Club. Doors open 8pm, Nitidus hit the stage at 10pm, Airbourne at 11pm. 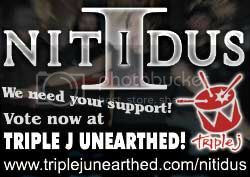 Go to shop.nitidus.com.au before they sell out!